Hello! Today I have another masculine card to show you that uses the McMahon Vintage Digital 'Fisherman'. I'm always in need of cards for men, so whenever Sue has a nice masculine image available, I sign up to use it! To make my card, I used a layout by Cindy Haffner (FTTC94), the designer paper is retired Stampin Up! 'Bella Birds'. I put the stripe panel, the main image panel, and the sentiment panel all up on dimensionals. The image is colored with Prisma Colored Pencils and Gamosol: my favorite medium for coloring vintage images. The sentiment is by Crafty Secrets. Be sure to check out the McMahon Five Designs Blog to see all the rest of this week's new releases. Also, visit my fellow design team members blogs too! They are listed in my sidebar. Amy, what a great masculine card,super image! You should join us over at SCH. This week our challenge is Masculine cards and this would fit right in. Amy wow what a fantastic masculine creation your coloring is AWESOME on this! 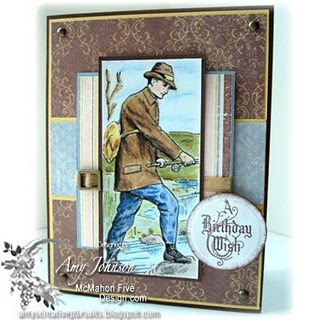 Wow Amy this is one fantastic make card that image, the papers and design are superb. Hi Amy! Love the browns and blues together on this great masculine card! Thanks for your beautiful work each week! Beautiful card Amy! Perfect image for a masculine card- love the great papers you used together. Wonderful card - great combination of colors and DP! Perfect for this image! Your card is stunning this week. The papers and embellishments you chose are perfect!!! oh wow, Amy- that is a great masculine image! And your papers and coloring make it so handsome. wow wow wow - you are so goood at male cards - this is fabulous - my hub would love!